Living in a different culture gives you the opportunity to view life with a different pair of glasses. There are many different stages to learning to live in the culture and we are way past the honeymoon stage but recently I gained a new insight into how authority is viewed in Cameroon. I’ve known for quite some time that the “patron”, or the boss, is not questioned and when the “big boss” or the General Director says something or someone says something on his behalf it is done, no questions asked. Now when someone says something over the phone, which seems out of context or abnormal; my first reaction, would not be to do the request; but I’ve learned that is not always the case in Cameroon. One of our security guards received a call that the General Director needed credit on his cell phone, the majority of people in Cameroon are on pre-paid cell phones and only buy a few dollars at a time for their phones since incoming calls are free. 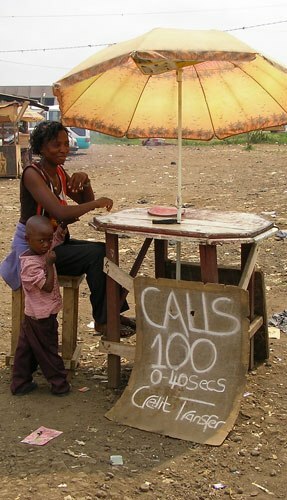 So on the road every 100 meters or so you can find someone that is selling credit for the cell phones. The man on the phone told the security guard that the General Director needed to send the credit to 4 different phones and he needed it immediately! So the guard left his post went down to the street found a call box girl, that’s the official title of someone who sits on the street to sell credit and small pieces of candy, not to be confused with a call girl which is what I said when I first retold this story. He had her transfer 60,000 CFA (an amount equivalent to his monthly salary) worth of credit to 4 different phone numbers because that is what the man on the phone said the General Director needed. Then he brought the call box girl back up to the gate of the center where we work and called the General Director’s Secretary and asked her to bring the money down to pay the call box girl. That’s when I received a call about it and was given the task to determine what happened. After hearing the story for the 4th time from the security guard, I finally asked why? I think he finally realized that he had been conned. Our organization has a corporate cell phone plan and members don’t need to buy credit on the street. Don’t accept instructions from someone over the phone if you don’t know who they are. The security guard learned that the log book already said not to ever buy credit for someone’s cell phone. Granted this was written in English and he only speaks French. Some mistakes are very costly. While cross cultural living comes with challenges I’m always amazed at how God uses these differences to teach me His truths in my own life. This entry was posted in Cameroon and tagged Authority, Cameroon, Hebrews 13:17, Scam, Submission. Bookmark the permalink. I never cease to be amazed at your adventures. Everyone was OK, I’m still working with the guard on how he is going to pay me back.